Check out these photos of my new office! I've been working on this redesign & reorganization since last Thanksgiving. I moved in last weekend and I'm LOVING IT! Bear with me here. This is a LONG post explaining all the steps and ingredients that went into designing the office - with pictures. I hope you find it worth the long read! Here is the BEFORE which I showed you in my Show Me Your Desk Challenge. THE MISH MOSH HAD TO GO! As you can see, I was using a mish mosh of leftover furniture which was functional, but not very attractive. That was fine when I was doing corporate consulting and no one came to my office. But now I interview people and have some client meetings here, so I decided it was time to do what I do for others and redesign my own office! I aso decided to move to a larger space to accomodate the greater number of projects I have going on. My dear husband suggested we dismantle our guest room, which was not used often, and offered to help me build the office of my dreams! He has been so awesome. He spent many hours painting and 5 hours building my new desk and file cabinets. I could not have done this without him! With a budget of $1000 in mind, I started sketching a design for the office and for a desk that would meet my list of needs. Then we started shopping around for furniture. The good news is I only spent $700 including new desk, monitor riser, shelf file cabinets, and new storage containers in my accent colors Chocolate Brown & Black. After several attempts at priming that did not cover the stains from old wallpaper glue, we finally put a thin layer of joint compund over most of the walls and voila, no more stains! We also customized the built in bookshelves that were intended for a child's room by removing the decorative moldings that blocked full use of the shelves (see photo 6). We painted the room a gorgeous light sky blue that has an alive feeling to it. (Benjamin Moore 2067-65) I chose this color for several specific reasons. 1) Blue is an excellent feng shui choice for study. 2) Light blue is also the feng shui color of harmonious expansion and gentle growth. 3) Blue & White (my trim color) brings the energy of the unlimited sky and happiness in to the space. 4) Over the years I've met people who do Aura readings and I was told that my aura is a very light sky blue. I was told to surround myself with that color would bring out my highest potential. Is this true? I don't know, but it can't hurt and I LOVE the color! And in the growth phase I'm in right now, I need all the help I can get to stay centered. I was able to repurpose existing Ikea shelving (IVAR) we had stored in the attic along with pieces I'd been using in my old office so that saved a bit of money - but even if we had to buy it new, the IVAR series is not very expensive. Using the T legs, I got to adjust the height of the desk to my perfect ergonomic keyboard height. Another feature I love is that there is nothing underneath the desk! The frame of the desk allows the whole thing to be supported with just 3 legs so I can slide my chair around with NO interference. You can't do that with 2 desks put together in an L like I had before. 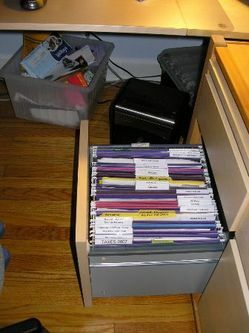 It also allows me to easily keep my MailMate shredder, trash and recycle bins under the desk See Photo 5. We built a monitor riser (shown below) so that I can slide my keyboard under it if needed. And I can keep phone chargers, digital recorder, etc. under it. We built the monitor riser using one of the half-rounds that go with the Galant desk and attaching 6 inch legs called CAPITA to it. Booking client appts Everything I need is handy in this zone. My phone, calendar, voice mail log and client folders.) BTW: I have my client folders in my Feng Shui prosperity corner with a light shining on them. Since I moved in, I've been booking a new client every day this week - And this is normally my slow season! 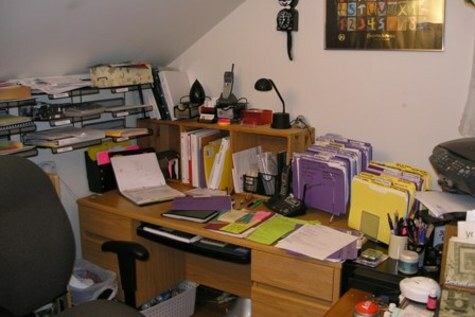 Project Management Zone- To the right of my action system are all my project folders and binders. Hanging Files and Supplies - Under my project system are 2 file cabinets (IKEA JONAS Drawer Unit) with file drawers and supply drawers to replace the ones my old desk had. Instead of using the casters that come with JONAS, we slipped the drawers into the IVAR 20 inch deep shelves. They fit neatly and don't roll around when I use them that way. Plus it lifted them off the floor so the file drawer was not so low. The only thing I don't like about this file cabinet is that the files go in sideways...which makes them a bit of a pain to get in and out of the drawer. Mail Processing Zone - To the left of my phone I use a magazine file as an inbox. I also have one to hold a notebook and my Voice Mail log. Next to that is my To Read magazine file. What you don't see in the picture is my black cat cup which holds my favorite pens, letter opener and scissors. Everything I need to process my mail in minutes is right here. letter opener, shredder, computer, recycle bin, calendar, action system, hanging files, etc. Anything that needs to be filed or shredded gets filed or shredded instantly. If it's a To Do item and will only take a minute or 2, I do it immediately. E.g., a bill to pay (I use online bill pay so it's REALLY quick. Redesigning this space was so much fun...and made such a huge difference in my productivity and ability to focus that I'm seriously considering formally adding Redesign / Interior Refining to my services. 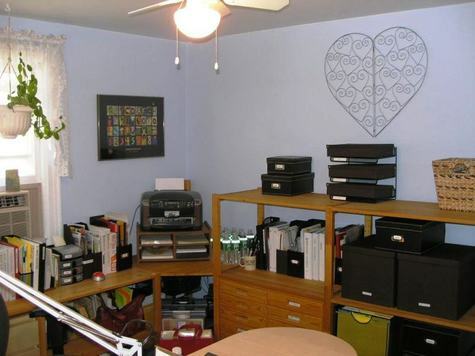 I already do redesign furniture layouts for clients but I always thought of it as just part of organizing as you can see in my office redesign photo gallery. I even redesigned my backyard which you can see pix of here. Redesign makes it hard to take recognizable before and after shots, but who cares. It makes a huge difference in how my clients feel about their spaces and makes them much more likely to maintain the new systems. Everything is positioned to make their activities easier AND look good too. I'm learning more and more that not all professional organizers do this. I'm really excited about diving deeper into how organizing and redesign combined affect the emotional, mental, and spiritual side of changing one's habits. It's simply not enough to decide to change. There is always a need to organize to make your new habits easier to act on. Making systems and spaces "attractive" is a critical component of changing habits as well. For me, the changes in my space have made an unbelievable difference in my habits and in how I feel about everything! Zoikes, I love before-and-after photos. Seeing your transformation is so inspiring. I love the fact that you can zip your chair anywhere you want, without any desk supports getting in the way. 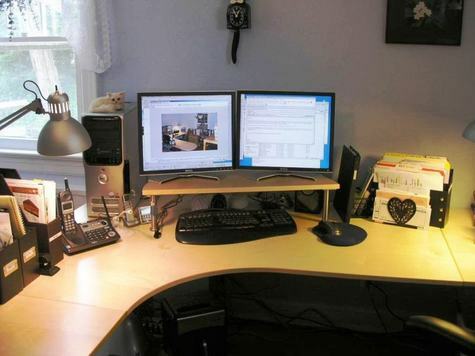 The monitor riser was a great idea, too -- do you like having the double monitor? I considered that but then decided I didn't think it would make that much different. You didn't include the answer to one important question: how many bags of trash did you throw away????? It's so true that outer order brings inner serenity. It just does. Congrats! I LOVE your blog!!!! And I am very jealous of your office. It is absolutely gorgeous. Thanks for visiting my blog. I'm glad to have you as a reader and you can't count on me to be visiting yours quite often and sending my readers over. This is a great post! To show a before and after is one thing- but give us al the nitty gritty inbetween is awesome. Looks great! Also, hurray for dual monitors! I "lobbied" to get them here at work for my team and it has made a huge difference in our productivity. I recomend them to everyone - haha! Reading emails on one side and being able to enter information on the other side is a big thing! gorgeous color, Ariane, what a peaceful command central you have. It's soothing and powerful at the same time. Rock on, GF! Thanks so much for visiting and for all your great comments! This post took me all week to get written and it's great to see that I've inspired a few of you to work on your own spaces. @ Gretchen: Believe it or not I did not have much trash! I did recycle a couple paper grocery bags worth of paper though. I also gave away a lot of furniture (I'm so lucky my cleaning crew could use desks, lamps, etc. So now my old office will become a den/guest bedroom. @ Melissa & Gretchen: Dual MOnitors ROCK!! I wish I had Three! Melissa you are so right...it is AWESOME to be able to have multiple windows open when you need to open one page to get the link and another to modify a graphic etc. @ Jessica - Good to see you!! Thanks for the feedback. I do feel powerful in here. Even when I come in here tired I get energized again. @ Brandie - Can't wait to see your new office...I'm sure it will be amazingly beautiful! BTW: I have my client folders in my Feng Shui prosperity corner with a light shining on them. Since I moved in, I've been booking a new client every day this week - And this is normally my slow season! Thanks for sharing your office photos... 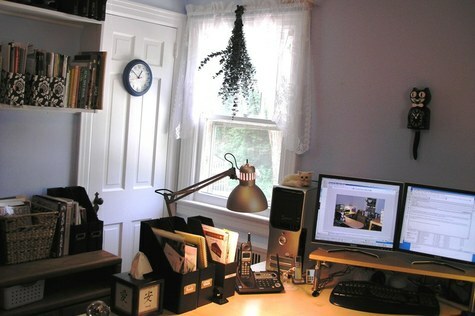 I love the layout, I also have since moved my office into a larger room, and pondered for weeks trying to find the right desk and place it in the right feng shui area, unfortunately my left shoulder is facing the door instead of my entire body. However, I have a question regarding the feng shui positions on your desk, did you use the bagua just on the desk? Hi Deborah! My left shoulder is to my door most of the time too...but I do a lot of my work facing the door as well. I used the bagua only on the room...not so much on the desk because it's so big and curved and really a huge part of the room. Thanks for stopping by! Wow, I cant believe that its the same office. Looks amazing. And the price wasnt too bad at all! Amazing transformation! No way, I would never have said that that is the same office. Looks completely different! Good job!